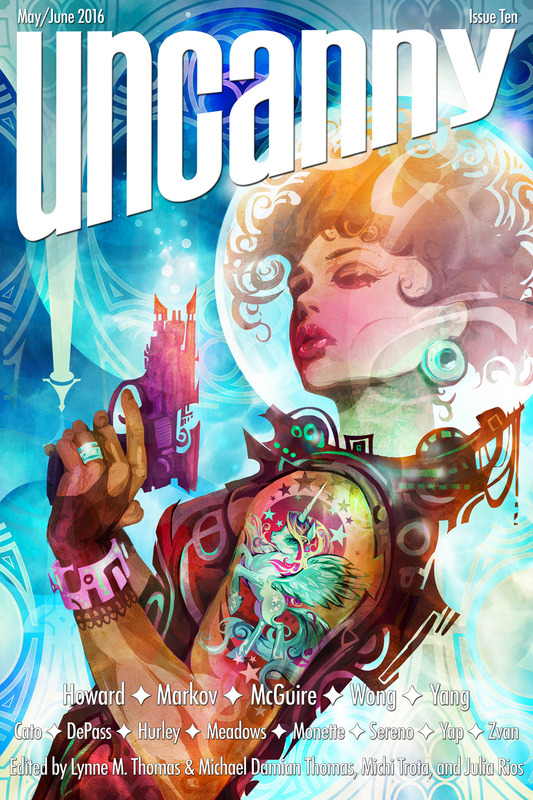 "The Plague Givers," by Kameron Hurley [bio] (edited by Lynne M. Thomas and Michael Damian Thomas), appeared in Uncanny Magazine issue 10, published on May 5, 2016. Pro: The story is well written, the dialogue is excellent, and the ending is satisfying. We like Bet from the start, and we slowly come to respect Lealez as well. Con: We never get a good idea why anyone would want to go around starting plagues, nor what that's such a problem that a major world organization spends all its energy fighting them. The multigender element is a distraction, since it's used purely for window dressing and has no impact on the story at all. I agree with the rating. It is a good story and worth reading. There is a 3rd gender in this world, with its own pronoun of "per".